You probably look for the newspaper’s fun stuff to spend some time with the “find the differences”, “Word search”, “Crosswords” and of course the Maze. Now you can create your own maze and print it for free. With Maze Generator you may choose the style of the maze, and also its difficulty. Choose between the number of rows and size, then you press “generate new” and you will have the perfect maze for you. 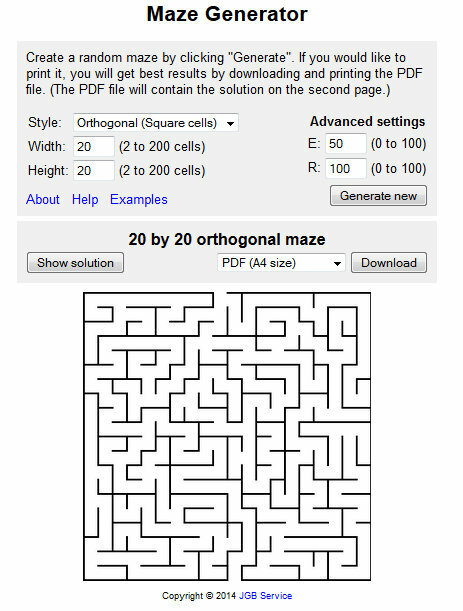 There is also an option to download a PDF pf your new maze and an option to see the solution. This entry was posted in Generators and tagged generators, maze by Carolina Goodfellow (Google+). Bookmark the permalink.